From Birmingham to Peterborough, cleaning companies all around the UK have their own tricks of the trade that help them excel in the work they carry out. From everyday products to totally unconventional goods, we bet that most companies are familiar with all sorts of humble cleaning saviours, like Coca-Cola. Coca-Cola? Are you sure? It may come as a surprise to many but when you review the basic science behind it, it’s actually quite believable and apparently, it works! In this article we’re going to take a look at just four of the top cleaning uses of this popular fizzy beverage. Now, the idea that Coca-Cola can successfully bust rust has been around for quite a while. However, many believe this trick is nothing but an old wives’ tale. How surprised do you think they were when they finally gave it a try? The truth is Coca-Cola is excellent at removing rust from surfaces. If you just so happen to have a collection of rusty objects lying around the house that could do with a little de-rusting, simply soak them in the beverage overnight and when morning comes, give them a good old scrub. You should find that the rust comes off a lot easier than it did before; this is due to properties in the coke that help to break down the existing rust particles. In addition, if your favourite chrome-finished bathroom towel rack has suffered as a result of speckled rust, simply grab a textured cloth and rub Coca-Cola onto the rust, sticking to a circular motion. Grimy windows can leave us feeling as though we’re on the other-side of gunk planet but luckily for you, the solution comes cheap. Now, you can choose to stick to your everyday window cleaner or you can pick up a cloth and a can of coke and give something new a try. You never know, you might just surprise yourself. This trick is particularly great for car windows that tend to build up a lot of dirt over time and it can be used on house windows too. To use, simply pour the can of coke over the window and rub the window with a damp cloth to remove any sticky debris or residue from the sugary drink. Pots and pans can grow unsightly and if you start noticing the classic black film forming over the bottom, it’s time to enlist a specialist; coke’s here to save the day. Typically speaking, this black film tends to form by either over-cooking or natural discolouration as a result of cooking acidic foods. To remove it using Coca-Cola, simply fill the pan an inch from the bottom up and keep an eye on it for about an hour, leaving the stove on a very low heat. After an hour, proceed to clean the pan as usual. Now, this section is actually quite shocking. If you think about it, coke can cause stains on white t-shirts just as easily as it can remove grease stains. So this trick is a bit of a weird one, but apparently it works very well. Instead of investing in expensive stain remover, simply pour a can of coke into your wash and use your everyday detergent before running it through your usual machine cycle. Now for the science stuff; coke can clean clothes like this due to the carbonic and phosphoric acid found inside the drink. While many will question how this beverage is actually safe to consume, according to life hacker, the amounts found in the drink are so small that they do not have an adverse effect on our health and stomach, only our dirty washing pile. 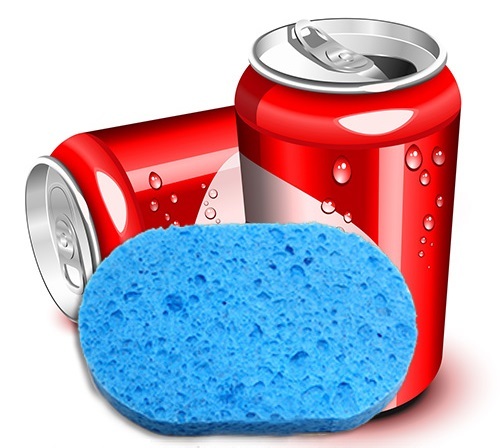 These are just four unique cleaning uses of Coca-Cola. In addition to removing grease stains, Coca-Cola is also rumoured to be quite effective in deodorising clothes that smell and removing blood from clothing. Wow!